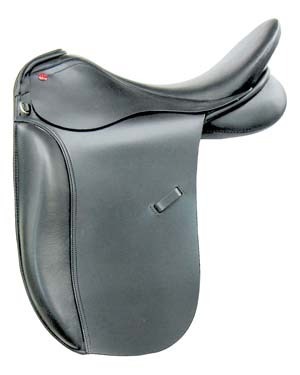 Sizes: 17", 17.5", 18", 19"
The Germania Klasse puts you in a "correct" position every time you ride. 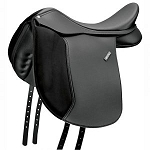 Designed in Germany with input from top Olympic dressage riders. 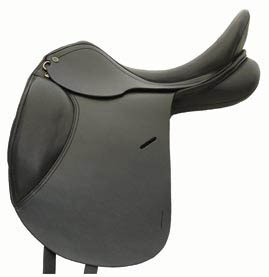 A sophisticated and correct saddle available at an unbeatable price. Features a beautifully balanced deep seat and soft external thigh rolls for close contact and comfort. The point and V billet provide for balanced girthing. 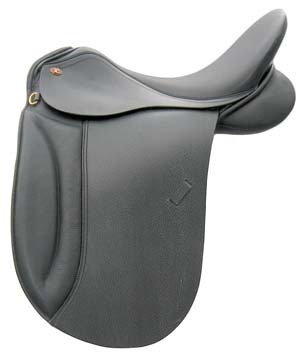 Thornhill’s trademark “soft seat” and wool stuffed, shaped panels make this saddle comfortable for both horse and rider. Fashioned in smooth black German bridle leather. Wides are hoop style trees that fit really broad backs. medium (32 cm), wide(34 cm) and extra wide(36 cm) tree widths. The medium tree is for most horses with more substantial width. The wide trees are for horses with wide backs and / or virtually no withers (e.g. large Warmbloods, Quarter Horses, Percherons). 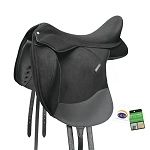 "As well as being a retailer, my children and I have been riding and showing exclusively in Thornhill saddles for the last 12 years, and I love the superb quality, craftsmanship, and balanced design that these saddles offer.